You are currently browsing the archives for the Dave Masters category. This is the same Dave Masters who was offended when citizens showed up to a September City Council meeting wearing red caps that said “Make St. Cloud Great Again.” At the time, Masters insisted that St. Cloud was already great. (That sounds like Steve Laraway, doesn’t it?) How can a city with one-fourth of its people living below the poverty level be great? According to these statistics, violent crime per 100,000 people is about double in St. Cloud what it is nationally. With a high violent crime rate and exceptionally high poverty rate, how can Mssrs. Laraway and Masters tell people that St. Cloud is a great place to live? Frankly, we need to fire all of these delusional politicians and replace them with people who don’t buy rose-colored glasses in bulk. I’d keep George Hontos and the 2 newly-elected city councilmembers and fire the rest — including Mayor Kleis. This isn’t a situation where a little tinkering around the edges will suffice. It’s a situation where real leadership and time-tested policies are required. Carol Lewis, Jeff Goerger and Kleis must go. Ditto with Laraway and Masters. Eliminate any of these politicians’ supporters, too. We don’t need more of the same failed policies. If you’re interested in rebuilding St. Cloud and turning it into a prosperous city once again, it’s time to step forward. If you think that things are just fine as they are, I’d suggest that you consider spending more time with your family. There’s no question that my councilman, Steve Laraway, wears rose-colored glasses. At least, there isn’t any question about that after reading Mr. Laraway’s recent LTE. Higher education: We have access to top-notch higher education opportunities. First, it isn’t surprising that Mr. Laraway praised CentraCare since he sits on their board. Next, people must wonder what solar system Mr. Laraway is from if he thinks that “we have access to top-notch higher education opportunities.” What Mr. Laraway didn’t mention is that St. Cloud’s economic metrics are terrible. According to the Census Bureau’s website, the median household income for the state of Minnesota is $63,217 in 2016 dollars. The percent of people in Minnesota living below the Federal Poverty Level, aka FPL, was 9.5%. By comparison, Hibbing’s median household income was $42,004 while 18.2% of its residents lived below the FPL. 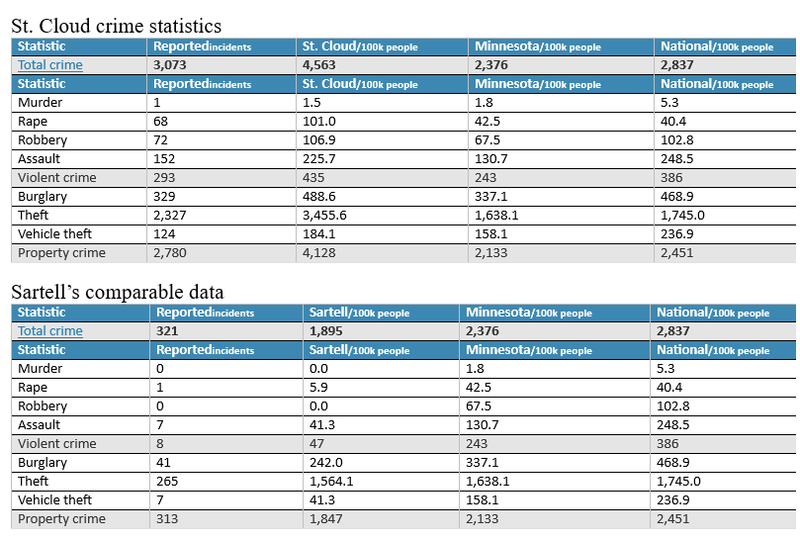 Sartell, St. Cloud’s neighbor to the north, has a median household income of $71,959 while 4% of its residents live below the FPL. Sit down before you read this set of statistics. The median household income for St. Cloud was $45,223. An astronomical (and frankly immoral) 23.2% of St. Cloud residents live below the FPL! How dare Mr. Laraway suggest that St. 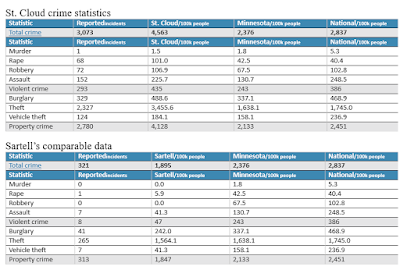 Cloud is a great place to live when one-fourth of its population is living below the Federal Poverty Level. For that matter, Dave Masters should be ashamed of himself for saying that St. Cloud already was a great place to live. Masters and Laraway are delusional or dishonest. At this point, it’s possible they’re both.